"Chapter One: The Hidden World"
The book opens with two alien ships dog fighting on the moon. They pass the JLA Watchtower and catch the interest of Superman and Martian Manhunter. One of the ships crashes and Superman and J'onn rescue the occupants. The rescued aliens are from a race called the Ghoji. They explain that their world was brutally attacked by another race of fish-like aliens known as the Voruk. The Voruk had a weapon called the Infinity Coil which seems to have forced everyone on the Ghoji's home planet into a state of hibernation/suspended animation. The Voruk apparently have a problem with their Infinity Coil, which is going to cause some sort of "unwinding of the time/space matrix" and destroy the universe. Either through insanity or incredible devotion, the Voruk leader will not shut the coil down and this breeds unrest in their people. The JLA, meanwhile, agrees to go to Penumbra (the world the rest of the Ghoji are living on) on a rescue mission. Upon finding what remains of the Ghoji, we see that they treat their fellow people who were wounded in the war with the Voruk as beneath them. They are viewed as cowards for choosing to live with disabilities (missing limbs and the like) instead of dying an "honorable death". This causes some reservations in some members of the League, but they don't really get time to discuss it. Apparently no one can get close to the Infinity Coil, not even Superman. It's effects are clearly shown to put him into some sort of hibernation/suspended animation when he strayed a little too close to it. The Ghoji solution to this is shield generators, which are unfortunately very large and not easily carried around. So they are installed into giant robots which will be piloted by each member of the JLA (with a Ghoji co-pilot). 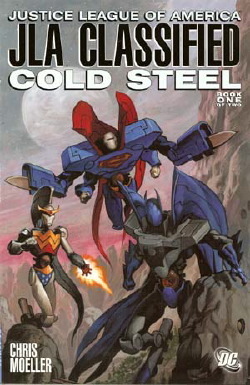 With Batman's help, the robots are each tailored to each JLA member's strengths and fighting style so that they can use their familiar tactics in battle. With a little help from the Flash and some paint, they are even decorated to resemble the league member that each of them is for. Just as they suit up and leave on their mission, a Voruk fleet of warships arrives and leaves us with a cliffhanger ending. Story - 3: This is a very hard story to grade. This is Book One of Two, which means it's only half the story. In that respect, it got me somewhat interested in seeing the next part of the story, but also a little worried about seeing the next part of the story. I admit that, upon seeing the cover, I did not hold high hopes for this book. I thought it was another lame, possible merchandising tie-in. What reason could there possibly be for Superman, of all people, to need to be inside of a giant robot? It may still be a try at a merchandising tie-in on DC's part, but to Mr. Moeller's credit it's worked into the story in what is a decently plausible manner. As movies like "Pirates of the Caribbean" showed us, there's no real bad ideas, just bad writing and execution. Who thought *that* movie had any chance of being good? And yet it was highly entertaining. "Cold Steel" is not highly entertaining, but it's not terrible, either. And this is why the next issue has me jointly in anticipation and worry. Either the next issue is going to make this into a really good story, or it's going to send the entire thing spiraling down into oblivion, becoming another in a long line of comics that I'll wish I hadn't spent my money on. For the most part everyone is in character, though character development is practically nonexistent here. In the beginning when the two alien ships are dog fighting on the moon, Superman uses his heat vision on one of them for no apparent reason that I can discern, and that bothers me. He doesn't just attack people for no reason. Granted the ship he attacked appeared to be the aggressor in the fight, but that doesn't mean they were unjustly so. It just seemed a little unlike him to not even internally question the motives behind the attack, much less try and ask someone about it before jumping to fighting. But on the whole it's a minor issue. The big issue seems to be whether the Ghoji are playing the JLA for fools or not. Both Martian Manhunter, via his telepathy, and Wonder Woman, via her lasso, make a point of trying to discern if the Ghoji are lying to them or if they're really the victims of an unprovoked, brutal attack. They claim that there are no lies being told, but Wonder Woman even makes a point of saying that "the truth can be shaded many ways." Of course, the way the Ghoji treat their wounded war veterans is disconcerting, but it seems too obvious. It feels like there's too many clues given to let us know that the Ghoji are really the bad guys. I almost feel like after some of them the writer is turning to us, the readers, and saying, "Everybody got that?" At the same time, the Voruk (or at least their leader) are not portrayed as angels, as the leader even kills a subordinate simply because he didn't like the information he was given. While I'm at it, the title irks me. Unless it plays into book two somehow, it's got nothing to do with anything. Steel for the robots? Sure, I suppose. Cold for... space? That's stretching it. It's really got nothing to do with anything so far. There's a lot of ways this could play out. Some have promise and ingenuity; others have cliche and groans of exasperation. There's no telling how this one's going to turn out yet, so I've got to rate it a 3, right in the middle. There's the potential for it to turn out great, but there's also the potential for it to be an unmitigated disaster. Art - 3: No matter what I end up thinking of the project, Moeller wrote and painted the entire thing himself, and I respect that. The art really turned me off at first. It's got a unique style that sometimes is lacking in detail (most times the JLA members are seen, and Batman, for example, almost always has no eyeholes in his cowl) and that sometimes is nicely detailed (the aquatic aliens). It's not great, but it's not bad. Kind of like the writing. Cover Art - 1: Wow, this cover does nothing at all for me. In fact, looking at the cover, it makes me *not* want to pick up the book. As I mentioned before, all this seems to do is play up the possible merchandising tie-in, which makes me think this book will be one long commercial for giant JLA robot toys. Zoom! Bang! Pow! KABOOM. Get yours now, for only $19.95 each! And don't miss the Toys R Us exclusive Wonder Twins 2-Pack. It's not a commercial, though, at least through Book One. The robots don't even show up until the last few pages. But this cover certainly gives the impression that it's little more than a marketing tool for hunks of plastic, and that's a big turn-off.